Tight calf muscles at the back of the lower leg is a common problem in athletes, especially those who run long distances. What are the calf muscles? Have I got tight calf muscles? What causes tight calf muscles? The calf muscle group consists of the gastrocnemius muscle and the soleus muscle. The gastrocnemius muscle is the larger muscle which originates just above the back of the knee and attaches via the Achilles tendon to the back of the heel. The Soleus muscle is deeper and originates from below the knee attaching through the Achilles tendon as well into the back of the heel. A professional therapist can assess the flexibility of the calf muscles, although what is tight for one athlete may not be the same for another. The signs of tight calf muscles that the athlete might feel is a gradual tightening of the calf muscles over time, which can get worse when running or improve while running only to tighten up later. Palpating (feeling) the muscles may identify tight lumps bumps and areas of spasm where the muscle fibres have tightened up and will be painful and tender to touch. A good starting point is to assess the flexibility of the calf muscles. One method of assessing calf muscle flexibility is to apply gentle pressure to the forefoot with the patient sitting with the leg out straight in front. There will be a point where the resistance noticeably increases as the muscle begins to stretch. It is likely the therapist will feel this before the patient feels a stretch on the calf muscles. Tight calf muscles may be caused by a combination of issues. Compartment syndrome occurs where the muscle becomes too big for the sheath surrounding the muscle causing pressure, sometimes pain, and restricted movement. Biomechanical problems of the foot or from running style can increase the strain on the calf muscles, resulting in repetitive strain and overuse. An injured muscle may tighten up to protect itself. Gait analysis on a treadmill can identify this and orthotic inserts may be prescribed to correct this. Tight calf muscles may have developed gradually over a period of months by not stretching enough before and after training. Tiny micro tears in the muscles cause them to go into spasm. When they are in spasm or contracted then blood cannot easily get into them. The muscles have squeezed the blood out like a sponge. If the muscles do not get enough blood then they will not get enough nutrients and so will tighten up to protect themselves and weaken and so on. Failing to stretch regularly can result in adaptive shortening and one of the most common causes of tight calf muscles is wearing high heels. Wearing heels on a regular basis is causes adaptive shortening of the muscles. Have the flexibility of the muscles tested and undertake a course of regular calf muscle stretching exercises which should be continued for at least 6 weeks. See a sports massage therapist who can give a deep massage. Depending on how bad it is they might need three or more treatments. It is important the gap between them is not too long as they will regress back to their original condition. Use a plantar fasciitis night splint which stretches the muscles overnight or at least prevents them from tightening up which often happens overnight. The night splint may take a little bit of getting used to but can be very effective in helping to stretch the calf muscles. Try stretching with a calf stretcher. These come in various designs. The slant board type is good for being a bit more scientific about your stretching in that measuring progress is easier. A rocker type calf stretcher is very effective at achieving a very deep stretch. Why do I stretch but seem to get nowhere? You might not be stretching enough even though you think you are. You might be stretching too hard. If you force the muscle the stretch reflex is triggered which contracts it. By going against this you are damaging the muscle. Stretch gently, do not bounce, ease into it and feel the muscle stretching. If it is just one leg that is tight you could have pressure on the sciatic nerve which causes the tightness. You should get this sorted out first by visiting a professional practitioner. It might be you have compartment syndrome. If pain or tightness comes on during a run and eases when resting this may be a possibility. Try the plantar fasciitis night splint which is worn on the foot overnight and is very effective in preventing the calf muscles from tightening up overnight. The calf muscles consist of the larger gastrocnemius muscle and the soleus muscle which is located deeper and lower down the leg. To effectively stretch both these muscles exercises should be done with the knee bent as well as straight. To stretch the big gastrocnemius muscle the back leg must be kept straight. Stand with the leg to be stretched at the back and hands on a wall at shoulder height. Bend the front knee and lean forward, keeping the back knee straight and pushing the heel down into the floor. When you can feel a stretch, hold for 20 seconds. If the stretch eases, lean further forwards until you can feel it again. But do not push too far in the early stages. Perform 3 repetitions and repeat this 3-5 times a day. To stretch the deeper soleus muscle the knee of the leg to be stretched needs to be bent. This is because the soleus muscle attaches below the knee and bending the knee allows the gastrocnemius muscle to relax leaving the soleus on stretch. Lean against a wall with the leg to be stretched at the back. Bend the knee keeping the heel in contact with the ground until a stretch is felt. Hold for 15 to 20 seconds and repeat three times. If a stretch is not felt then another method is to place the ball of the foot against the wall and bend the front knee until a stretch is felt. As flexibility increases or if you have particularly flexible calf muscles it may be better to stretch using a step. Lower the heel off the step dropping down until a stretch is felt. Hold for 15 to 20 seconds for 3 repetitions and repeat 3 to 5 times a day. 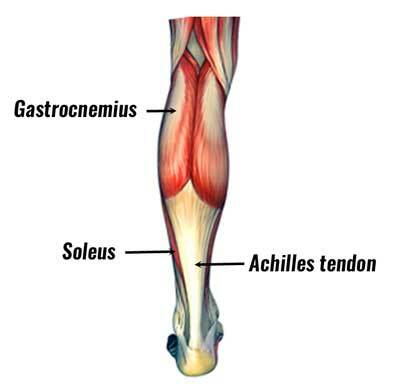 The soleus muscle can be stretched similarly but with the knee of the leg to be stretched kept bent. Sports massage can help relax tight muscles, improve flexibility and the overall condition of a muscle. IMPORTANT: Before starting any massage treatment the therapist will check for contraindications (if any apply to you, then massage is not allowed). The aim of sports massage is to release tension in the muscle and stimulate blood flow and healing. More details on the benefits of sports massage are available. Massage must not be performed during the acute stage of this injury – usually 48 hours after injury. For grade two and three strains, massage may not be suitable for over a week. This is because if there is still bleeding then heat and massage will increase bleeding, causing further damage. A lubricant is needed to allow the hands to glide smoothly. Oil is the most commonly used form of lubricant. Do not use too much oil. Enough to allow for smooth, controlled movement is required but too much oil may result in less control over the tissues.